Dennis Wayne “Bud” Garrett, 50, of Kingsville, was born, May 3, 1968, in Harrisonville, the son of James Allen and Patricia Ann (Denney) Garrett. He departed this life, Friday, February 8, 2019, along with his father at their home near Strasburg. Bud attended and graduated from the Briarwood State School in Harrisonville and he worked for the Casco Area Workshop. 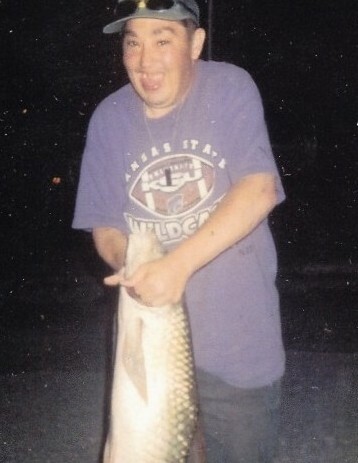 Bud loved fishing, tending to his animals, playing with remote control cars, and watching movies. He also loved his music; playing as loud as he could. He especially enjoyed working with jig-saw puzzles. He often would get several boxes out, mix them up, and then build each puzzle from the center out. He loved being around people and had several “girlfriends”. He will be missed by all who knew him. Dennis is survived by his mother, Patsy; two brother’s John Garrett (and Mary Lou) of Kingsville, and Jamie Garrett (and Heather Mathis) of Holden; 5 sisters, Linda Cupp (and Tommy Poindexter) of Pleasant Hill, Donna Parton (and Randy) of Pleasant Hill, Kim Phillips (and John Clark) of Belton, Melissa Garrett of Holden, and RaeLynn Cottrell (and Jason Mathis) of Kingsville; numerous nieces and nephews; other relatives and many friends. Funeral services for both Bud and Jim were held Sunday, February 17, at the funeral home. Reverend D. Kent Deubner officiated. Visitation was held prior to the service at the funeral home on Sunday. Inurnment will in the Strasburg Cemetery at a later date. Memorial contributions are suggested to the family and may be sent in care of the funeral home.